There is good contrast in the photo from start which will also help us in using this technique. Start by opening the file in photoshop, directly followed by adding a new Hue/Saturation layer. By default the adjustment is selected and the layer mask is completely white so changes done will affect the entire photo. Using the handle button you can instead of changing individual color channels just click and drag inside the photo to add or reduce saturation of that selective colourspace. Here I use the handle, click on the green part of the photo, and with the left mouse button pressed drag to the left to decrease. Since the flower is in a completely different color then the background I do not need to cut out or lasso any parts of it. 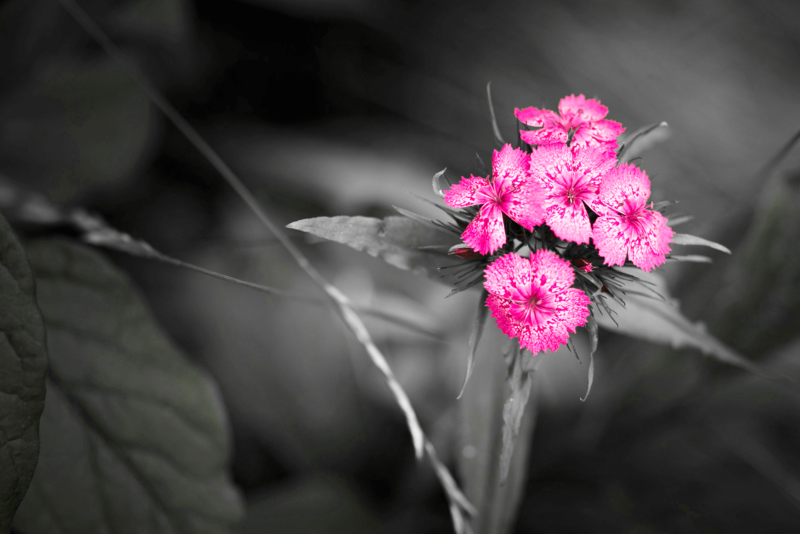 The result is a quick and easy selective color photo of the flower.